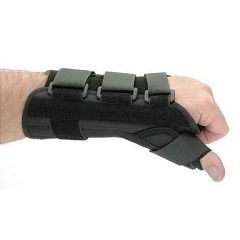 Form Fit Wrist Brace - 8"
Because of the bulkiness of the splint, it may be better as first splint after CMC joint surgery, when a person feels most comfortable being totally immobilized. True to size. Quality splint. Superior comfort. Wrist sprains. DeQuervains tendinitis. Arthritis pain. I need to wear a splint 24/7 for DeQuervain's Tendinitis. This product provides the best contoured immobilization of wrist and thumb of any I have used - combined with comfort cushioning next to the skin. Finger use is somewhat limited, so I do alternate splints for different tasks. Bulky. Velcro sticks to everythi. A sturdy appliance, performs function of immobilizing hand/thumb, biggest problem is velcro sticks to clothes, and even my tolltag - a small challenge! How do I properly measure for size for the Ossur form fit thumb spica for left wrist? Yes, both wrist and thumb have a metal support. Very sturdy and supportive. does this have metal supports in it for wrist support AND thumb support? Answered on Feb 20, 2012 10:46:19 AM by nanny from fancy gap,va.